Bundesliga | Who is…new Frankfurt keeper Lukas Hradecky? Who is…new Frankfurt keeper Lukas Hradecky? Frankfurt – Given Eintracht Frankfurt’s attacking instincts – the Eagles finished as the fourth highest scorers in the Bundesliga last season with 56 goals – it was perhaps inevitable that they would also concede a good few at the other end (62). Their goalkeeper at the time, Kevin Trapp, was duly called into action more than most and had ample opportunity to showcase his abilities, doing so in such impressive style that French giants Paris St. Germain recruited him over the summer. Frankfurt took their time to sign a replacement, making sure they found a custodian with the requisite lightning reflexes, positional awareness, experience and temperament to handle life in Germany’ top flight. Eventually they got their man: Lukas Hradecky. Although born in Bratislava, Slovakia, Hradecky is a Finland international after moving there as a child and representing the country at various youth levels. He cut his teeth in the game at Finnish club Turun Palloseura, before moving to Danish top-flight outfit Esbjerg fB in 2009 at the age of 20. The following year he won the Finland U-21 Goalkeeper of the Year award and established himself as a member of the senior Finland squad in 2011. A transfer to Danish Superliga heavyweights Brondby IF followed in 2013, and he went on to win the division’s Goalkeeper of the Year prize. And now, having made a total of 120 appearances in the Danish top flight, the 25-year-old’s steadily upward career trajectory continues to rise with the step up to the Bundesliga. The powers that be at Frankfurt have no doubts that he is up to the challenge. “Lukas has all attributes of a modern goalkeeper, with fast reactions, good vision and solid passing,” club sporting director Bruno Hübner said at the goalkeeper’s official unveiling. “He’s regarded as the best keeper in the Danish league and already has some international experience." Praise indeed for the towering custodian, who stands at 190 cm tall and has been given the No.1 jersey. Hradecky was equally pleased to have joined the Eagles. “I’m delighted that the deal with Eintracht finally came together, I always wanted to join a Bundesliga team,” he told the club’s official website. “I’m looking forward to the first match as Frankfurt’s keeper and to experience the atmosphere at Commerzbank Arena - I heard so many great things about the support." 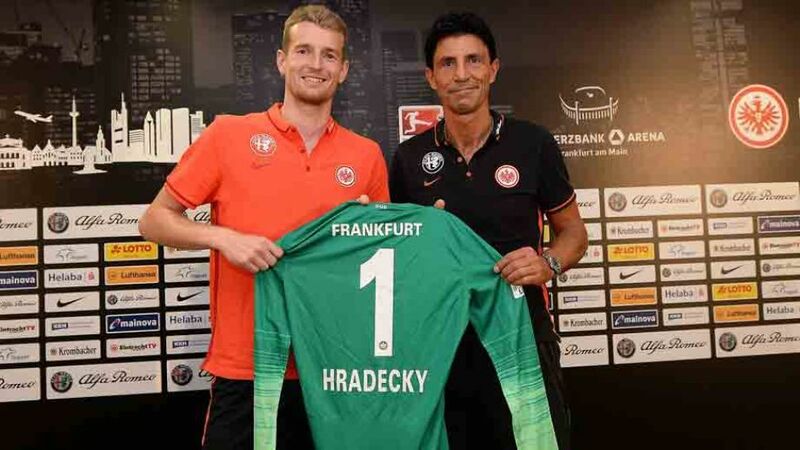 Of course, only time will tell if Hradecky can go on to become a fan favourite in Frankfurt, but as his path to the top so far has shown, he tends to achieve his aims eventually.